Logs are sawn and piled high, the olives have been pressed and the new wine tasted, and the dispensa, or larder, is well stocked with tomato passata: welcome to another winter edition of the Marche Voyager newsletter. And a Buon Natale e Felice Anno Nuovo to you all. The 2014 edition of the celebrated Michelin Red Guide for Italy lists seven restaurants with one or more stars in the Marche. Both Uliassi and Madonnina del Pescatore in Senigallia retain their coveted two stars, while five restaurants boast one star - from north to south these are Symposium at Cartoceto, Le Busche at Montecarotto, Andreina at Loreto, L’Enoteca at Macerata and Emilio at Fermo. Once more the wine award season has brought an abundance of prizes for winemakers in the Marche. A total of eighteen wines managed to win Gambero Rosso's prestigious Tre Bicchiere awards for Italy's finest wines, thirteen of which were outstanding examples of verdicchio. If you're planning to visit Le Marche next summer, Macerata's spectacular 2014 open-air opera festival in July and August includes Verdi's Aida and Puccini's Tosca. Pesaro's prestigious Rossini Opera Festival in August includes Rossini's Armida and Aureliano in Palmira. After the highly successful exhibition at London's National Gallery last spring, a major exhibition of the works of Federico Barocci is set to take place in 2014 in the Marche and neighbouring Umbria. Barocci was one of the most talented artists of late 16th century Italy but has, until recently, remained little known outside of his native Marche. He was born sometime around 1533 in Urbino where he remained for most of his life until his death in 1612. The Federico Barocci, il Pittore nella Terra del Duca exhibition will take place in four towns - Urbino, Pesaro and Senigallia in the Marche and Gubbio in Umbria - in late spring and summer of 2014. Full details of dates and venues are yet to be announced. 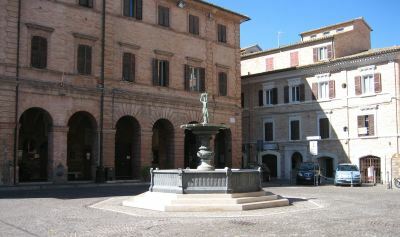 This month's image of one of the region's piazze, or town squares, features the pretty fountain that decorates the main piazza in Osimo in Ancona province. The town, once the ancient Roman Auximum, boasts a clutch of outstanding buildings and its brick-built centre warrants a visit. The Combover, an entertaining novel by the Macerata writer Adrián Bravi, has just been translated into English and published as an ebook. It's the story of a university lecturer who, in a moment of desperation, flees to a cave in the mountains above Cingoli and is mistaken for a miracle healer. "Extremely amusing, yet also strangely unsettling" was how one reviewer described it. We couldn't miss out the festive fun of Christmas markets, cribs and New Year’s Eve events, so what better than this list from the regional tourist department. The name of the region's capital Ancona comes from the Greek ankon meaning elbow, due to its elbow-shaped natural harbour.